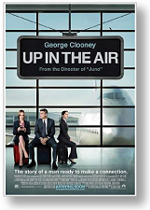 “Up in the Air” is directed by Jason Reitman who also co-wrote the screenplay. He’s the Academy Award nominated director of the mega-hit “Juno” (2007). The story is based on a novel by Walter Kim of the same name. Currently it stands as the number one film on my list for 2009. The script is crisp and flows evenly throughout; you’ll be hard-pressed to find a dull moment. The cast is first rate with stand out performances by George Clooney and two other actresses, Vera Farmiga and Anna Kendrick. It’s the story of Ryan Bingham (George Clooney), a frequent flyer who has racked up close to 10 million miles on American Airlines. He’s in heaven when he’s in the air and taking off to a new city. In his case, it doesn’t matter where; sometimes it’s Omaha, and he’s still happy. His job is emotionally tough. He fires people for a living, although he thinks he’s pretty good at it and has the formula down to a science. As all great stories in film unfold, there’s usually a romantic involvement of some sort. In this case it’s with mega frequent flyer Alex Goran (Vera Farmiga). She and Clooney meet in a chain hotel bar similar to a Marriott. It’s almost ‘mutual fatal attraction’ as each discovers the other’s love of flying through their multiple reward cards. They hook up immediately and agree to meet next when their schedules match up. Back at the home office, Bingham is informed that a fresh young Cornell grad Natalie Keener (Anna Kendrick) has devised a computer program to fire people over the internet. Of course Bingham is concerned as he sees his time in the air fading before his very eyes. He immediately challenges her new approach and main boss (Jason Bateman) sees his apprehensions. Bateman decides to send Anna and Ryan out on the road together to test the idea and the alternative motive is to have older, seasoned Ryan mentor Amy. We are given an ‘in your face’ view of Bingham in action on the job and these are some of the best scenes in the film. Clooney is smooth and charming in this role. He reminds me of Cary Grant as a leading man. Distinguished for sure, he becomes better with every film and this one is certainly one of his best. Farmiga, as Clooney’s lover, is amazing onscreen. She’s like a breath of fresh air! I so enjoyed her performance. She sparkles next to Clooney. No doubt we’ll be seeing more of her in future films. Her character is not as developed as Clooney’s, however. We don’t see her at work or in her home. Although Clooney does pay a surprise home visit to her in the film and we are filled in a bit concerning her personal life. Clooney’s mentoring of go-getter Natalie Keener is also wonderful to watch. She’s perfect for the role and does an outstanding job as well. The film displays the pulse of our current economic situation and the reality of taking a plane to work instead of other transportation. As Clooney states in the beginning of the film, “Everything you hate about flying, those are the things that make me think I’m at home.” He also says, “To know me is to fly with me.” He explains further that his flight choice is all about loyalty, and loyalty has its rewards! I know this character well as my husband has over 7 million miles on American Airlines (he’s been told that he’s in the top 2% of fliers in the US) and another 2 million on United. He’s actually great to fly with as he has packing and airport security down to a science. We are usually met by a special service agent who inquires if there is anything we might need or they check to see if our flight was ok. Many times they call us to the desk and pre-board us first on the plane. I used to think this was really strange, but now I’m used to the treatment and view it as part of our flying routine. The great part is that the airlines now actually knows my name. Yes, loyalty has its perks. Although it still seems strange, very strange, to have a company so concerned about your travel. My point in reference to my husband is that the character Ryan Bingham does exist in our world. The unfortunate part about Ryan Bingham is that he’s become so isolated from family and social situations, he doesn’t know how to have a normal relationship. The role is perfect as dichotomies of emotions are in the script and Clooney plays them out with brilliance. You won’t be disappointed by much in this film other than the fact that we are in an economic crisis and we experience the emotions of numerous employees who have just been let go from their jobs.